Ideal Chemical’s flagship brand, the EverClean™ Specialty Chemical Division was developed specifically for commercial laundries and related services, based on over 75 years of expertise. EverClean™ is the Ideal solution for healthcare, hospitality, dry cleaning, and industrial commercial laundries. Complete line of laundry chemicals designed to bring a balance of speed and efficiency with products that are innovative and cost-effective. For a list and description of EverClean™ products, click here (PDF). Ideal’s team of experienced EverClean™ Service Technicians can program and service all types of laundry equipment to meet/exceed customer’s requirements. Ideal’s staff of professional laboratory and quality control chemists are constantly formulating EverClean™ products to meet Environmental and Industry challenges. New products are being developed to provide “Green” technology while maintaining unsurpassed quality to meet the Design for the Environment (DfE) standards. Simple to order and manage optimum supply levels for each operation. Whether your laundry consists of a 50 pound washer or a large tunnel washer, EverClean™ products can meet your specific needs. Ideal will bring you efficient, profitable, and cost effective laundry supplies in sizes ranging from one gallon jugs to multi-compartmented bulk deliveries to satisfy any size requirement. 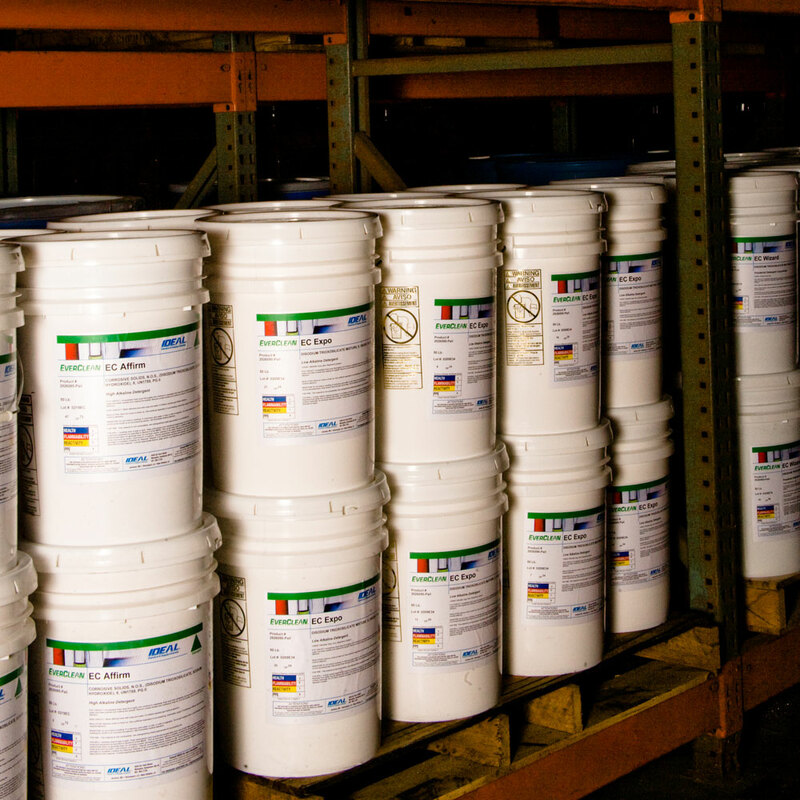 Ideal will install a turnkey chemical storage and supply process that is safe, clean and efficient.